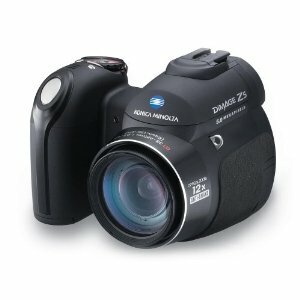 The Konica Minolta Dimage Z5 is a 5-megapixel "super-zoom" type point-and-shoot with a 12x optical zoom lens. I purchased mine online as a factory refurbished model years ago and still use it today. It's a decent camera for the price. The 12x optical zoom is nice, although there are newer super-zooms with more magnification these days. The CCD-based image stabilization system works well. The super-macro mode on the Z5 is one of my favorite features; with a 0cm focus length it can literally focus on objects touching the lens. The Minolta flash shoe for attaching an external flash is also useful, especially since the on-board flash is fairly weak. Autofocus is very fast as long as there's enough ambient light, but the lack of an autofocus light means it has problems in low-light situations. Battery life is excellent for an AA-powered camera, and personally I find taking AAs instead of a proprietary battery pack a plus, since it makes it easy to carry around a spare set or two of alkalines in case your rechargeables run out in the field. The Konica Minolta Dimage Z5 camera interface is also excellent, the menus are simple and easy to navigate and there are a few button controls, including an assignable button. Image quality is pretty good, but it does have some issues. The biggest is definitely noise; even at the lowest ISO levels there is a fair amount of noise, and the highest ISO settings are pretty much unusual. Some folks might find the noise levels preferable to excessive on-board noise correction, though. With its weak on-board flash and lack of an autofocus light as well, this is probably not a camera for taking dark indoor shots. Images on this camera also tend to be somewhat underexposed, though this can be easy enough to correct for in manual mode or via the exposure setting. The auto white balancer also has problems, especially with artificial light. It does have several white balance presets and a metered white balance option that can overcome that shortcoming, however. Overall the Konica Minolta Dimage Z5 is a pretty decent super-zoom point-and-shoot if you can find one for a good price. I probably wouldn't pay full retail for it, however; there are other super-zooms with comparable features in its price range that don't suffer from the noise issues on the Z5. Join in and write your own page! It's easy to do. How? Simply click here to return to Consumer Digital Camera Reviews. Copyright © 2008. All rights reserved. Digital-Photography-Tricks.com.